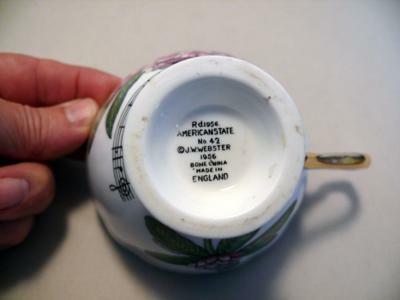 Pottery Mark Query JW WEBSTER:- Grandfather was a rhododendron nut when they were first brought over to the US. This was obviously his. I Googled JW WEBSTER in every way I could think of and get nothing! J W Webster is not a known English maker, so no idea about this cup, sorry. Very interesting story though. Hope someone can identify this pottery mark. I too found some of this makers tea cups and saucers- nevada, idaho, and kansas. I haven't found any other website but yours that even mentions the set. It seems to be an american state series. Located my 3 in an antique shop in glendale, ky. If you learn anymore info I'd be interested I just bought one at a fundraiser for $2.50 in Fintry Provincial Park in Canada. I just found a J.W. Webster cup & saucer for Arizona at an estate sale. Would love more information on these cups if anyone finds some. I also came across a Tea Cup and Saucer by JW Webster. It has two Prairie Roses and Musical Staff on the front with the words NorthDakota, We will honor thee, North Dakota famed from sea to sea. 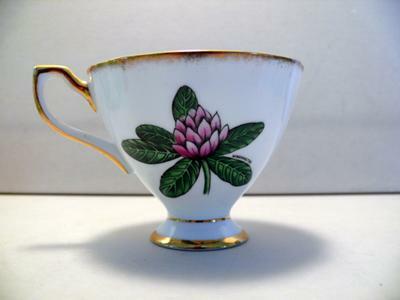 Gold Trim and a lime green interior on mug and Saucer top.On Bottom of Saucer is imprinted Prairie Rose the State Flower of North Dakota..American State Flower Series..State No. 39 11-2-1889 Fine Bone China Made in England by Taylor and Kent and on the Teacup bottom it reads RD 1956 AMerican State NO. 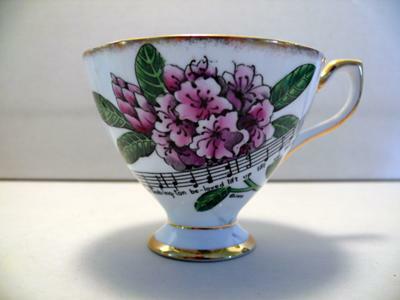 39 Copywright JW Webster 1956 Bone China Made in England, Was wondering also if has any value?? I have the Washington cup n saucer any offers? I have number 2 with Pennsylvania dated 1956 . Stumbled on this thread while looking for info.on my find. I know this is an old post but I have a Tea cup/saucer marked ©J.W. Brewster Fine Bone China Made in England for Ardalt. It is called the American State Flower Series. Mine is Michigan, my home state, Apple Blossom. Don't know if this helps or any of you were still searching. I have the 31st State California. Says: Rd.1956 AMERICAN STATE No. 31 TRADEMARK J.W.WEBSTER 1956. BONE CHINA MADE IN ENGLAND. Saw a cup only on eBay for Wisconsin and Illinois for sale. No SOLD items however. I just purchased No. 27 Florida from Ebay. I have a collection of cups and saucers and thought it was interesting. I would like to purchase an Illinois set if anyone has one.